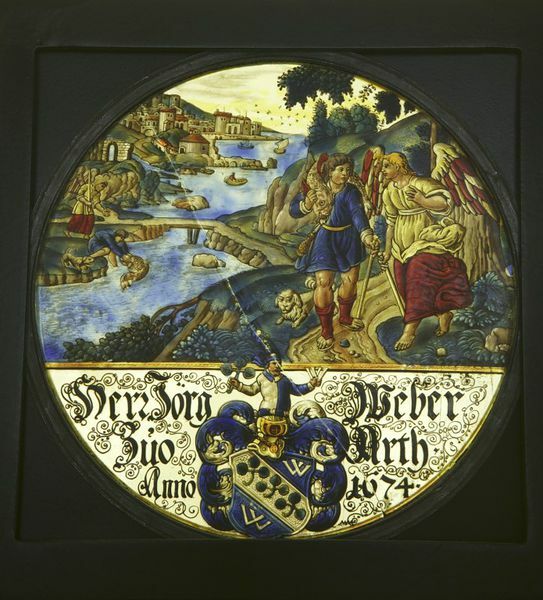 The two scenes depicted on this roundel are taken from the Old Testament Book of Tobias (or Tobit). One scene shows Tobias drawing a fish from the River Tigris, the other shows Tobias and the archangel Raphael on their journey. The Book of Tobias relates the story of the pious aged Jewish man, Tobias. Through a series of misfortunes Tobias lost both his wealth and his eyesight. He told his son, also named Tobias, to travel to a relative's house many miles away across desolate and mountainous country to recover money owed to him. The young Tobias hired a guide to take him on this journey. This was the Archangel Raphael, but the celestial nature of his guide was unknown to Tobias until he returned home from his journey. On the way the two stopped by the River Tigris and Tobias decided to bathe. A large fish came out of the river and bit his foot. Raphael instructed Tobias to catch the fish and cut out its heart, gall and liver, which he was to keep to be used as medicine later on. The arms are of Jorg Weber of Arth in the Swiss canton of Zug. The painting was perhaps made by Michael Muller IV, who was a glass painter in Zug in Switzerland. There were many glass-painting workshops in Switzerland during the 16th and 17th centuries. The skill of the Swiss painters was famous, and in the 19th and 20th centuries their works were highly collectable. The roundel is painted in enamels on clear glass. 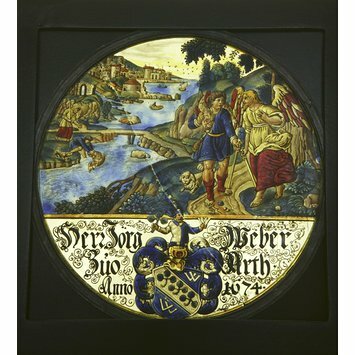 In the middle of the 16th century, new techniques for producing decorated glass were introduced. Glass paints known as 'enamels' were used to paint directly onto the glass, similar to painting onto a canvas. To produce the colours, metallic oxides were added to a glass frit mixture. The resulting colour range included delicate pinks, reds and purples. Roundel of painted glass. In the upper part is a landscape in which are two scenes from the book of Tobit - Tobias drawing the fish out of the Tigris, and Tobias on his journey with the angel Raphael. Below is a shield bearing the arms of Jorg Weber of ?, Canton Schwyz, with an inscription and the date 1674. The shield is surmounted by a helmet with crest and mantling. The painting is in dark brown, silver yellow and enamel colours, the design being partly executed by the use of the point. Formerly in the collection of Henry Vaughan. The two scenes depicted on this roundel are taken from the Old Testament Book of Tobias (or Tobit). One scene shows Tobias drawing the fish from the River Tigris and the other shows Tobias and the Archangel Raphael on their journey. The Book of Tobias relates the story of the pious aged Jew Tobias. Through a series of misfortunes Tobias lost both his wealth and his eyesight. He told his son, also named Tobias, to travel to his relative’s house many miles away across desolate and mountainous country to recover some monies owed to him. The young Tobias hired a guide to take him on this journey. This was the Archangel Gabriel but the divine nature of his guide was unknown to Tobias until the end of his journey and he had returned home. On the way they stopped along the River Tigris and Tobias decided to bathe. A large fish came out of the river and bit Tobias’ foot. Gabriel enstructed him to catch the fish and to cut out its heart, gall and liver which he was to keep to be used as medicine later on. The painting is attributed to Michael Muller IV who was a glass-painter in Zug in Switzerland. Glass-painting workshops were numerous in Switzerland in the 16th and 17th centuries. The skill of the Swiss painters was renowned at the time and their works were highly collectable in the 19th and 20th centuries. The roundel is painted in enamels on clear glass. In the middle of the sixteenth century, new techniques for producing decorated glass were introduced. Glass paints known as 'enamels' were used to paint directly onto the glass; similar to painting onto a canvas. The colours were produced by adding metallic oxides to a glass frit mixture and the resulting colour range included delicate pinks, reds and purples. Roundel of clear glass painted with enamels and yellow (silver) stain. Depicting two scenes from the Book of Tobias and a coat of arms. Made in Switzerland, dated 1674. In the upper part Tobias can be seen drawing the fish from the Tigris and walking with the Archangel Raphael. Below is the heraldic achievement of Jörg Weber of Arth, in the Canton of Zug.